President Trump is once again at odds with some of the country's most powerful tech executives. The commander in chief took to Twitter Wednesday morning to announce his plan to stop transgender people from serving in the military after speaking with "generals and military experts" on the topic. Silicon Valley CEOs joined a chorus of voices protesting the move and calling it discriminatory. Facebook (FB) CEO Mark Zuckerberg posted on the social network site he created, saying "everyone should be able to serve their country -- no matter who they are." Jack Dorsey, the chief executive of Twitter (TWTR) and Square, said "discrimination in any form is wrong for all of us," and added the hashtag "#LetThemServe." 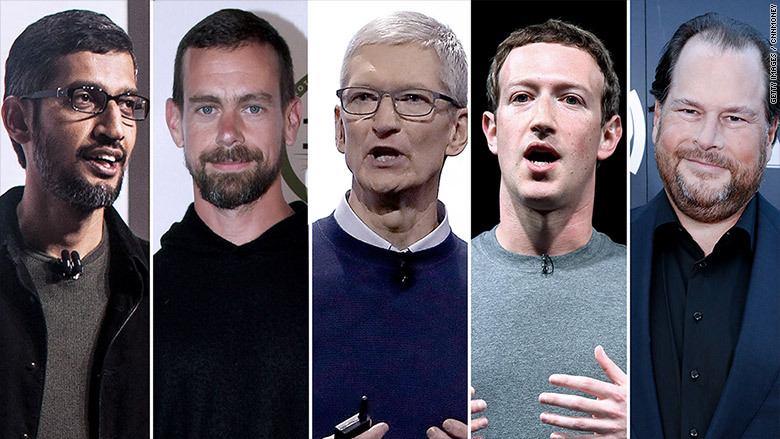 Apple (AAPL) CEO Tim Cook, Google CEO Sundar Pichai, Salesforce (CRM) CEO Marc Benioff and Microsoft (MSFT)President Brad Smith also expressed their disapproval on Twitter. In a series of posts, Trump said he decided to keep a ban on transgender military applicants in place because "our military must be focused on decisive and overwhelming...victory and cannot be burdened with the tremendous medical costs and disruption that transgender in the military would entail." Trump's decision Wednesday reversed a policy which was approved by the Defense Department under President Barack Obama, but still under review, that would allow transgender individuals to openly serve in the military. Trump's announcement sparked immediate backlash from LGBTQ-rights leaders. The American Civil Liberties Union called the decision "outrageous and desperate" and vowed to fight the policy change. The tech sector bigwigs -- who are known for their progressive voices and willingness to speak out against the current administration -- were quick to join in. Earlier this year, tech executives and others protested Trump's decision to pull the United States out of the Paris climate agreement. That move even lead tech leader Tesla (TSLA) CEO Elon Musk -- along with Disney (DIS) chief Bob Iger -- to step down from the private-sector advisory councils they sat on.